Princess is very proud of its connection with The Love Boat, and aims to be a leader in cruise ship romance. To this end, the cruise line just announced a new Department of Romance. 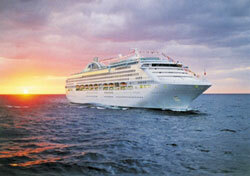 Its “romance experts” are expected to help Princess’ guests experience the highest levels of onboard amour. This dream team, if you will, consists of dating guru Trish McDermott, therapist Dr. Ruth Westheimer, wedding planner Alba Carreras, and the Love Boat’s captain, actor Gavin MacLeod. I’m not sure whether these known personalities are actually sitting in on planning conferences to create onboard amenities or have merely allowed Princess to mention their names or sell their products. Regardless, Princess has clearly demonstrated that it’s serious about love. The department will roll out several romantic programs throughout the year. If you missed the opportunity to book a Valentine’s Day sailing, you’ll have future opportunities to woo your loved one on a Princess ship. Here are some of the options becoming available this year. The “Romance by Room Service” package includes champagne and chocolate, rose petals scattered in your room, scented candles (flameless, of course), and romantic music. Guests can also order the “Ultimate Balcony” dinner for the complete in-room date. Princess’ Scholarship@Sea program will introduce a course about sustaining long-term romance. Could be more interesting than computer skills. “Romance TV” programming will bring chick flicks, er, romantic movies to your stateroom’s television. The Princess website will feature a section on romantic travel. This one’s my personal favorite: Princess’ daily onboard newsletter will feature a romantic tip, quotation, or affirmation every day, so guests will be reminded to celebrate and strengthen their relationships. Awww. Of course, these amenities are in addition to the line’s standard romance programs. You’ll still be able to propose via video on the ships’ giant outdoor movie screens, or get married by the ship’s captain in an onboard wedding chapel. Whether you find these options overwhelmingly romantic or incredibly cheesy, you can’t deny Princess is trying hard to create an atmosphere of love onboard its ships. If you don’t think a 2,000-passenger mega-ship is the epitome of romance, Princess is determined to prove you otherwise.